Last month, we talked with Mike Roe, creator of the website, The Guy's Guide to Plastic Surgery, www.guysguidetoplasticsurgery.com, and presented Part 1 of the interview. Here's Part 2, where Mike goes into more detail about what men can expect from the plastic-surgery experience. Boomerful.com: Mike, what benefits can a guy expect from plastic surgery? Any thoughts on how it will effect his career and relationships? MR: Let's say he's been thinking about a cosmetic procedure for a while, like I did with the broken blood vessels on my nose and cheeks. When I finally did something about it, not only was it a real relief, but also an immediate and lasting one. Harriet La Barre was a former staff editor at Cosmopolitan who wrote a book in 1970 called, "Plastic Surgery: Beauty You Can Buy" (Holt, Rinehart and Winston). Although plastic surgery has evolved, she said something that I think is just as relevant today: "Positive psychological effects often go hand in hand with the correction of physical defects. The more attractive appearance can release what psychiatrists call psychic energy. That is, when a person is no longer preoccupied, embarrassed, and self-conscious about a physical defect, he is free to think of other things." Of course, it's hard to say how plastic surgery might effect a man's career or relationships. One thing for sure is that looking better often leads to feeling better, which can lead to living better. So, it seems only logical then that looking and feeling better would have a positive effect on all aspects of his life. My little laser treatment took less than 20 minutes, yet improved not only my look, but also my outlook. Boomerful.com: Any warnings or cautions for guys looking into plastic surgery? MR: A man needs to research not only the procedure he's interested in, but also the plastic surgeon who will ultimately perform it. He needs to make sure his doctor is a board-certified plastic surgeon, because it's legal for a medical doctor to market his- or herself as a "cosmetic surgeon," although they may have zero experience with a specific procedure. The American Board of Plastic Surgery has a page entitled, "Is your surgeon certified?" The American Society of Plastic Surgeons (all ASPS members are board-certified plastic surgeons) has a similar page called, "Find an ASPS member surgeon." Once he's completed his research and selected a couple of qualified plastic surgeons, he should schedule a consultation. Then, at the consultation, he should look for a surgeon with whom he feels comfortable, as well as review the surgeon’s before and after photos. As they say, a picture is worth a thousand words, and a before and after picture can speak volumes as to the artistry of the surgeon. I would also caution a man to seriously think about why he's contemplating plastic surgery. For whom is he doing it? If the answer is anyone other than himself, then he's doing it for all the wrong reasons. Again, a man should never elect plastic surgery to please someone else. Finally, he should maintain realistic expectations. Boomerful.com: Let's talk cutting-edge. What are the latest advances in plastic surgery for men? What does the future hold? MR: I'm certainly not the first one to say it, but some of today's most cutting-edge procedures don't require any cutting at all - cosmetic fillers, laser hair removal and BOTOX® Cosmetic. And, even with surgical procedures that obviously require some cutting, such as a facelift, thanks to endoscopic techniques, incisions are shorter, scarring is less noticeable, and downtime is reduced. As far as what the future holds for plastic surgery.... Again, I'm not a doctor, but I think most plastic surgeons would agree that laser will ultimately replace the scalpel, which should further reduce recovery times, pain and scarring. Nanotechnology and nanomedicine are also likely to play important roles in the future of plastic surgery. Take gene therapy. Someday, it might be possible to program cells in a lab, which could then be injected into the body for the sole purpose of instructing other cells to produce collagen. WebMD had an interesting post about tissue engineering, in which they talked about how living tissue could be created and then used to replace skin that’s been damaged or is diseased. One thing that’s for sure is that plastic surgery will be more effective, safer and more popular than it is already. Sander Gilman, a professor at the University of Chicago, went so far as to speculate that, "By the year 2020, no one will ask whether you've had aesthetic surgery; they'll ask why you didn't." My final prediction? "Mommy Makeovers" have been all the rage the last few years. I predict that in the future, we'll be hearing a lot about male plastic surgery, or "Daddy Do-overs." In fact, I think the future's now. Boomerful: Thank you for taking the time to talk with us, Mike! My first thought when picking up this tidy little book was "what a great title!" Maybe this help-make-getting-older-not-quite-so-depressing collection of advice will be better than most of the articles I've read in those check-out counter magazines whose cover titles scream "Help! I'm old and I can't get up ... or get down ... or this is how we can help you get up and get down." I'm not saying they offer bad advice. Mostly, it's good advice, poorly packaged. 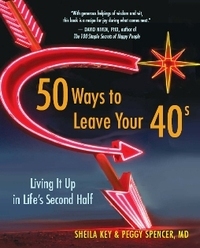 So, I was delighted from nearly the first page of "50 Ways to Leave Your 40s"! In fact, this book is just fun-filled great advice! In line with its delightful title that immediately tuned Paul Simon into my brain, Sheila Key and Dr. Peggy Spencer kept the beat going with music/memory-evoking chapter titles such as "Take a Load Off Fanny" and "Break on Through to the Other Side". Great music with the right advice to go along with these wonderful songs in my head. The Band and Jim Morrison probably never saw it coming! * "Cool Moves" - lots of simple exercise moves to tone, strengthen and even alleviate pain. * "Things to Try at Least Once" - just what it says and I love what I've seen, so far. * "Doc in the Box" - good advice on subjects from stinky feet to bad breath - head to toe coverage, so to speak. * "Scribbles & Doodles" - to get us on the road to the healing and joyful habit of journaling. This is truly a primer on how to feel good about living longer and better. But, it's also more than that. It's a great, laugh-out-loud (and at yourself) read. I may always keep it near as a refresher on living right and right now.